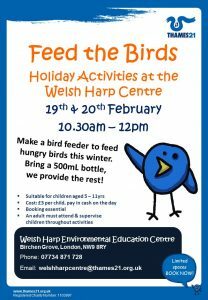 Join us at the Welsh Harp Environmental Education Centre for half term activities. Make a bird feeder to fill with yummy birdy treats to feed the hungry birds this winter. Bring a 500mL water bottle, all other materials, including food for the birds will be provided. We may go for a walk in the woodland so also bring outdoor shoes and clothing. This activity runs on 19th and 20th February. Activities suitable for children aged 5-11 years. £3 per child. An adult must attend & supervise children throughout activities. Places are limited and booking is essential, please contact us to book and also let us know if you need to cancel your booking. Please pay in cash on the day. £3 per child. There will also be a Guided Bird Walk on the Welsh Harp Reservoir on 21st February 2pm-3:30pm run by the London Wildlife Trust. This event is free for everyone including families, no need to book, just turn up. Please meet on the viewing platform overlooking the reservoir by Cool Oak Lane Bridge.